Abandoned lots and litter-strewn sidewalks, or rows of green beans and pockets of wildflowers? Graffiti-marked walls and desolate bus stops, or shady refuges and comfortable seating? What transforms a dingy, inhospitable area into a dynamic gathering place? How do individuals take back their neighborhood? The Great Neighborhood Book explains how any community can be improved and enlivened, not by vast infusions of cash, not by government, but by the people who live there. Through real-life stories, this book addresses such challenges as traffic control, crime, comfort and safety, and developing economic vitality. 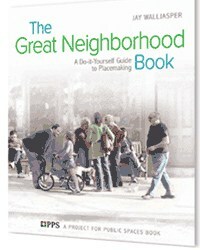 Offering compelling evidence of how people in communities have enhanced their own neighborhoods through “Placemaking” — the PPS term for the process of transforming public space — this exciting guide offers inspiring real-life examples that show the magic that happens when individuals take small steps, and motivate others to make change. This book is a must-read not only for neighborhood activists and concerned citizens but also for urban planners, developers and policy-makers.